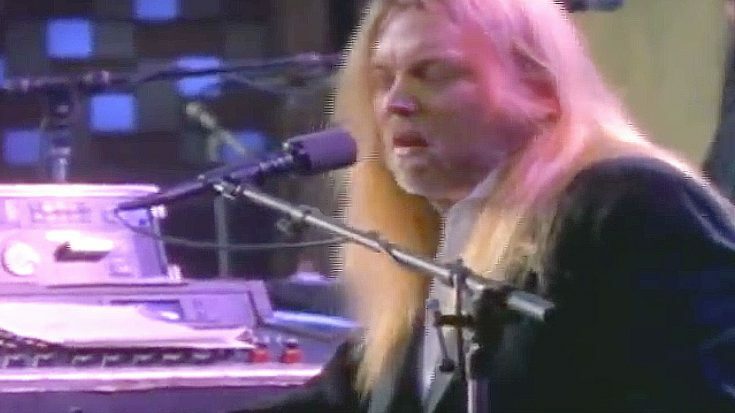 Written in 1970 and featured on The Allman Brothers Band’s Idlewild South, ‘Midnight Rider’ is the song that’s come to best define Gregg Allman. He’d seen it all and done it all and lived to tell the tale, and while our favorite midnight rider was used to battling through struggles alone as he talks about in ‘Midnight Rider,’ it’s only onstage that Gregg never rode alone. In 1989, he brought along friends Bonnie Raitt, the Neville Brothers, and Herbie Hancock for an all-star performance of ‘Midnight Rider’ that’s everything we love with a few extras thrown in, too. While Gregg runs the show from behind his organ, Bonnie Raitt supports him with a slide guitar performance that would have surely made the late Duane Allman smile, with the legendary Aaron Neville coming in strong with the perfect harmonies to support Gregg’s signature raspy, whiskey soaked voice. Fun Fact: Gregg Allman and roadie Kim Payne broke into Capricorn Sound Studios to record ‘Midnight Rider’. Gregg now calls it the song he’s the most proud of, and the best of his career. How great is this? What I love the most about this performance is the fact that Gregg, Bonnie, and the Neville Brothers are all great friends and even bigger fans of each others’ work – in fact, the same performance even features the group performing covers of each others’ songs! If that’s not getting by with a little help from your friends, then I’m not sure what is.